Essentially, these are the world’s doxologies. This is what they are ascribing glory and purpose to. It is usually self-glorifying and has little or nothing to do with worshipping the One True God. 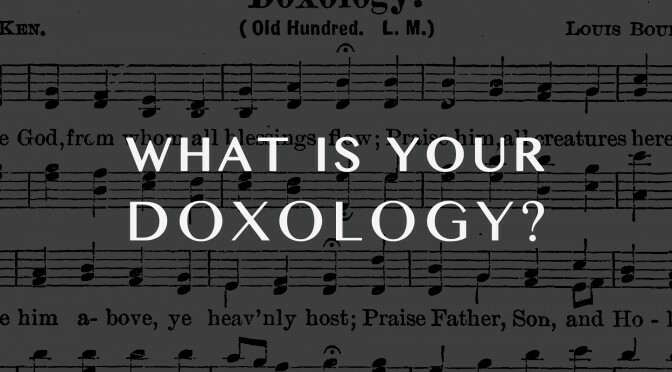 What is a doxology anyway? The word literally means “Glory Saying”. Traditionally it’s been viewed as a statement of glory being ascribed to the God of the Bible. But really, in a functional sense, it’s anything we ascribe glory to. All Christians must have a CHRIST-CENTERED DOXOLOGY. In everything we do, whether in times of suffering or gladness, be strengthened by the gospel, and life’s ultimate purpose; to glorify God. We must rejoice in the victory won for us in Christ through the strengthening of the Gospel. We are made right with God through the sacrificial death of Christ in our place, and raised to life again for our promise. Paul’s doxology in the end Romans Chapter 16 is one that encapsulates everything He has tried to explain to us in the beautiful book of Romans. The diagnoses of sin, deliverance from it, and the reality of living out the Christian life is on Paul’s mind as he writes this. To the immediate read, one might conclude it to be quite anti-climactic compared to the rest of the letter. To the contrary, this ending is quite fitting. Now to him who is able to strengthen you according to my gospel and the preaching of Jesus Christ, according to the revelation of the mystery that was kept secret for long ages but has now been disclosed and through the prophetic writings has been made known to all nations, according to the command of the eternal God, to bring about the obedience of faith—to the only wise God be glory forevermore through Jesus Christ! Amen. 2) Joyfully glorifying God as the ultimate purpose. No one will remember you 70 years from now. This whole idea of legacy of you is a farce. When we move on in however long the Lord has penned for us, the things we do for the most part, will be forgotten. The one and only thing we can contribute is to be involved in this great story of God where we join with Him in spreading the fame of Christ to the ends of the earth, and by God’s grace make an impact for the kingdom. Here is a taste of what secularists and others think of life. Essentially what they are saying is that there is no meaning outside of your own belief and will. It’s ultimately irrational, because what is a purpose without a purpose? A purpose that is worth dying for should have a purpose or it is ultimately meaningless. Sure, you can like collecting cars and love feeding the poor, but why? It’s like asking someone why they work out…. “well to be healthy”… okay why be healthy? “So I can do well at farming cause I love working the land”. Okay, why work the land? To help feed people in my community”. Okay great, why is feeding people a great purpose? “So people can live”. Then what is the meaning of life? As for the Christian. We have a beautiful doxology. The Gospel. When you have an awful hour, day, week, month, year… you can point to your purpose which has a purpose. Jesus. It’s rational and He carries us through suffering and He is everlasting truth. The Greek’s were intrigued to this idea of ‘truth’, or some sort of principle of order and knowledge that one can attach themselves to. A sense of purpose that had order, meaning and a foundation to it. They would consider this term ‘logos’ when trying to reason out the things of life together. John, the writer of one of the gospels was keen to understand his audience being that the book was written in Greek. Truth, meaning, order and purpose is not an idea or an abstraction, IT’S A PERSON! Jesus. There are other doxologies in scripture. Peter’s Doxology, John the revelator’s Doxology, Paul’s Ephesian Doxology and Jude’s Doxology. Okay, really… what is my current doxology? What does my story so far say? What does Stephen’s Christ-centered doxology sound like? Father. I know that I am a wreck, that without you, there is nothing that pleases you. Left to my own devices I would certainly destroy myself by waddling in my sin of lust, power, greed and ultimately making life all about me. How grateful I am to know that life is not all about me, but about you. That ends and means don’t point to me, but to you. That when you look at me, you don’t see my filthy self-righteousness but you see Your Son and perfection He’s put on me like a refreshing waterfall on my dry parched body. Praise to the Father, Son and Holy Ghost for my beautiful wife and family; my brothers and sisters in Christ that you have so faithfully wrapped around me to help me understand I am not alone. Let everything that has breath praise You. Amen. Write out your doxology. See to it that God receives all the glory in it.